The greatest gift bestowed to someone is your time. 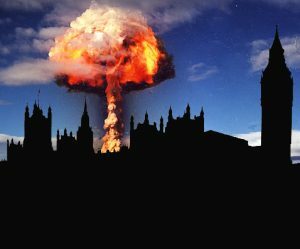 London was destined to be the first hydrogen bomb testing ground. Time is fluid, often gifted and taken away at Her Majesty’s pleasure. It’s not celebrities, politicians or rock stars that influence the future; it’s humble men like my late grandfather, Donald Lovatt (aged 96) who willingly joined the para’s age 17 to join the fight against totalitarianism in WW2. Millions of ordinary people came together to change a very bleak looking timeline at that time. Proudly, my Grandads wartime contributions included helping to blow-up a Nazi-controlled heavy-water factory in Norway. Heavy-water was an essential ingredient in the embryonic hydrogen bomb manufacturing process in 1943. An act of bravery later depicted in the film The Heroes of Telemark. The victors always rewrite history, but it was German scientists who developed the first atomic technologies that were later integrated into the US military under the name of Project Paperclip in 1945. The Nazi’s V2 rockets that later spawned the race to The Moon were developed as a carrier to deploy the embryonic atomic bombs to London and beyond. London was only weeks away from becoming the first ever hydrogen bomb test site. My Grandad, a humble man, but a great man helped retain ‘The Great’ in Great Britain. One of his memorable wartime escapades involved disobeying orders in Italy to fly home on a supply plane. He parachuted into the factory where my Grandma was war-effort working and snatched a romantic weekend before heading back to Italy on the same now fully-laden flight. Whatever job he was going to do going forward, my Grandma (Edi) always knew she had the best man in Bolton from that day forward. His act of rebellious chivalry resulted in my Dad being conceived and the rest, as they say, is family history. Time and tide wait for no man, but acknowledging those millions of wartime contributions that changed the course of history, is a good analogy for how I view the uptake of alternative energy technologies like solar panels today. Thirty years of solar panelled freedom or thirty years of waiting for the next inevitable price rises? Counts of voluntary bravery, such as Michael Lushman whose service on the HMAS Sydney aircraft carrier allowed him to witness the ultimate destructive power of human engineering. His contribution toward seventy-years of peacetime involved the infamous Operation Hurricane which saw the first British atomic bomb detonations at Trimouille Island, Western Australia in 1952. The whole crew of HMAS Sydney was deliberately exposed to high doses of radiation that ultimately led to fatal cancers for the majority. Able seaman Lushman recounts a time when the aircraft carrier encountered a Tropical Cyclone and had to push all the aircraft overboard into the ocean. This time must have been a very nail-biting and stomach-churning time for all those aboard. There service allowed two generations of post-war children to live under a protective umbrella of mutually assured destruction – a real blessing when you consider the alternatives. Ordinary were people making extraordinary sacrifices for us today. And that brings us neatly to the world today, and a threat to our civilisation far greater than Hitler could have imagined. Today, the ecological collapse happening around us and the toxic threat by energy companies who are terrified to usher in the green technology age and lose your £1200 per year income is now the fight of our time. To cut through the Nazi-learned propaganda machine that permeates our modern media today is a must. Those who fought for our freedom, a freedom I now use to help homeowners out of the financial abyss called traditional energy. Humble heroes, merely deciding to draw a line in the sand at a pivotal time in history. Ironically, while our backwards-looking politicians argue about immigration that they bombed into existence, Germany again is powering-ahead technologically with they’re anti-nuclear, PV and EV future. Metaphorically speaking, Germany is again developing futuristic jet planes as our lot argue about who makes our propellors. The pursuit of alternative energy technologies like PV solar panels (photovoltaic) is a pursuit of a ‘viable’ timeline going forward. Looking back is important, but never before in human history is progressing away from traditional energy so vital for generations to come. Remembering Donald (Don) Lovatt’s bravery ensured that his four children, fifteen grandchildren and twenty-eight great-grandchildren could live in a time of peace – unprecedented in human history. Remembering Michael Lushman who volunteered to retain ‘The Great’ in Britain. Lest we forget, the consequences of our actions and inaction’s that reverberate for decades or centuries to come. Time to acknowledge yet another pivotal moment in the story of our species.